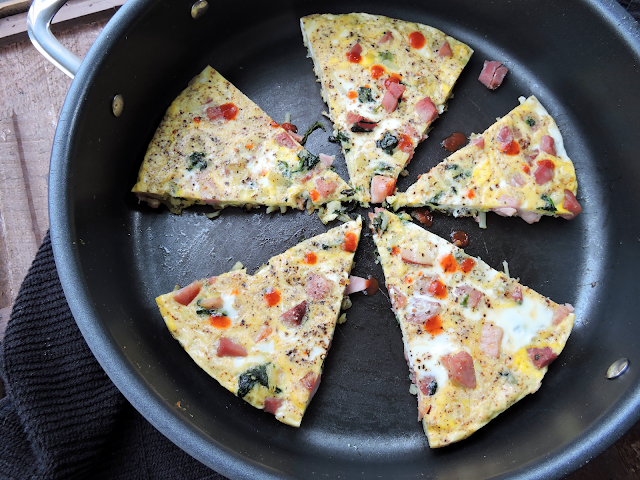 This morning, I'm excited to share with you my simple recipe for a breakfast frittata that will put your leftovers to good use! I hate to see food sit in the fridge and go to waste~ so this is the perfect way to be resourceful and get the most out of your ingredients. It will also save you on cash & extra cooking time in the kitchen! This dish comes together in less than 20 minutes, and is as pretty as it is tasty! I've written this recipe the way I would make it: Paleo-friendly & workable for a Whole30. However, do feel free to change it up to fit your family's taste buds! You can add cheese or use whole dairy milk instead of coconut milk. Just treat this as a guide, and get creative! In a medium bowl, whisk together the eggs, coconut milk, and spices. On the stovetop, heat the cooking fat in a large oven-safe skillet over medium heat. Sauté the hash browns & veggies until tender, then stir in the diced meat. Pour the whisked eggs over top, and do not stir. Allow the eggs to cook on the stove for 2 minutes, then transfer to the oven. Cook for 10-12 minutes or until the eggs are "set" (don't jiggle if you shake the pan). Slice & serve hot with garnish of choice! Any leftover meats will work! Try ham, tri-tip, steak, or sausage. For veggies, you can stick to something simple like spinach or broccoli, or stir in whatever leftover vegetable you have on hand. Try butternut squash, bell peppers, mushrooms, or asparagus. I like using an all-purpose spice blend like "Paleo Powder", or a mix of dried onion, garlic powder, and salt & pepper. This is a simple recipe, that you can easily dress up with a fancy sauce, pretty herb garnish, or slices of avocado. Get creative!